In the wake of the axing of dozens of CSIRO climate science jobs, Connor Tomas O'Brien explores how scientists are grappling with feelings of powerlessness – and learning (slowly) to present themselves as passionate and opinionated public figures. After announcing cuts to more than 60 climate science jobs – and receiving significant pushback for it – CSIRO chief Larry Marshall recently argued that there is so much ‘emotion in this debate’ that ‘it almost sounds more like religion than science to me’. It was an odd message for the head of Australia’s national science agency to send, especially as it appeared designed to cast doubt on the legitimacy of the work of researchers employed by his own organisation. The charge that emotion gets in the way of legitimate scientific work is a curious one. On the one hand, it’s impossible to truly believe that scientists do not form opinions – and strong feelings – about their work. At the same time, though, the implausible stereotype of scientists as intellectually detached and unfeeling research automatons remains stubbornly culturally ingrained. To describe a scientist as ‘emotional’ still reads as a criticism, more often than not. Is it realistic – and beneficial – to continue believing that scientists aren’t human? In Esquire last year, a longform essay by John H. Richardson explored a depression epidemic facing those long perceived to be most immune to the sway of strong feelings: research scientists – in particular, those working in the field of climatology. Forensic psychiatrist Lise Van Susteren, meanwhile, has identified the emotional reaction some climate scientists have to their work as ‘pre-traumatic stress disorder’ – a preoccupation with the troubling long-term findings of climatology, exacerbated by the feeling of powerlessness many in the field have when it comes to compelling those in power to respond to their findings responsibly. One of the problems is the way scientific findings make their way into the world – or fail to. If we still believe that emotion has no place in science, a reasonable rebuke might be that frustrated scientists should stay in the labs and out of the fray, tamp down their feelings, and simply work harder. To stand firm in the belief, in other words, that good science always prevails. The unfortunate truth, though, for researchers looking to ensure that their work is properly acted upon, is that good science is often not enough – and the ability for scientists to remain phlegmatic is often challenged by the sense that their work is failing to speak for itself. One of the problems is the way scientific findings make their way into the world – or fail to. For many scientists, journals provide a primary outlet for speaking publicly, but few outside of academia have the spare time, money, ability or inclination to sift through digital libraries to interpret findings. There’s a very real possibility that other scientists aren’t reading, either; in a recent attempt to gauge the level of engagement with academic journals, Asit Biswas and Julian Kirchherr estimated that the average paper is read, on average, by only ten people – including other researchers. Asit Biswas and Julian Kirchherr estimated that the average paper is read, on average, by only ten people – including other researchers. ‘It doesn't matter how interesting your results are if they languish in an obscure journal forever and never get enough attention to have an impact on policy, culture, and humanity,’ says Philippa Karoly, a STEM PhD student. But, she explains, few scientists are encouraged to pursue publication opportunities outside the peer-reviewed safe space journals provide, especially as engaging with public necessarily takes time away from researching – and few researchers have the skills required to translate their findings so that they’re interpretable by a general audience. Scientists who decide to speak up and counter misinformation in the mass media, for example, are often met with hostility for rising above their station – or are viewed as biased for attempting to too-loudly defend their own findings. Even researchers who attempt to stay out of the fray and in the labs, though, can find themselves targeted if their research proves too influential. After geophysicist Michael Mann’s ‘hockey stick’ global warming graph was published in Nature – one of the few peer-reviewed journals that continues to reach a broad audience – he found himself subject to a sustained harassment campaign that continues 16 years later. Dozens of climatologists with no public profile have found themselves subject to ‘strategic litigation’ attacks from front groups that appear to be indirectly funded by major oil companies. For some, the solution is to retreat so far into the laboratory that the outside world can’t engage with – and skew or wilfully misinterpret – contentious findings. Climatologists whose work is nearly impossible to decipher, after all, can at least benefit from ‘security through obscurity’, in the hope that harassers will select more prominent targets to make examples of. Others are deciding to avoid including policy recommendations in their papers, in order to avoid charges that they are deliberately manipulating their research with an end-goal in mind. Other scientists, meanwhile, might strongly consider moving to Europe, where harassment campaigns are less organised and scientists can more easily slip under the radar. Still, such strategies don’t come close to solving the broader problem, which is that the expectations placed on scientists to behave ‘professionally’ – in other words, objectively and unemotionally – are rendering them powerless to ensure their work meets meaningful responses. 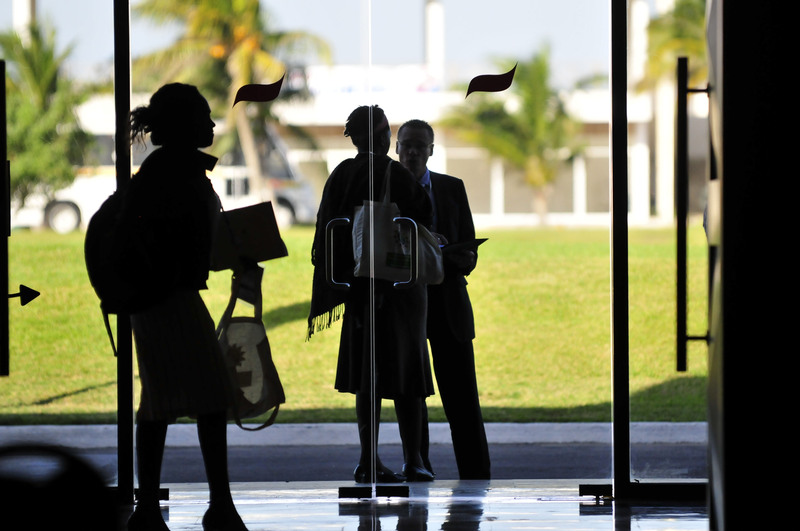 Slipping into the shadows may offer a modicum of personal security, but it renders it difficult for scientists to engage with policy-makers, who rarely proactively seek out research, and instead wait for it to be digested by others. For some scientists, this tension – between being unable to catalyse action through good research alone, but feeling precluded from taking further action themselves – is too great. Sometimes, this results in scientists deciding to leave their field in order to find other ways to effect change. When James Hansen retired from his position as NASA’s former top climate scientist in 2013, for example, he did so because he wanted to take an active role in fighting the US government’s inability to lower emissions, and to protest the strip mining of oil sands in Canada. After all, ‘As a government employee, you can’t testify against the government,’ he noted. 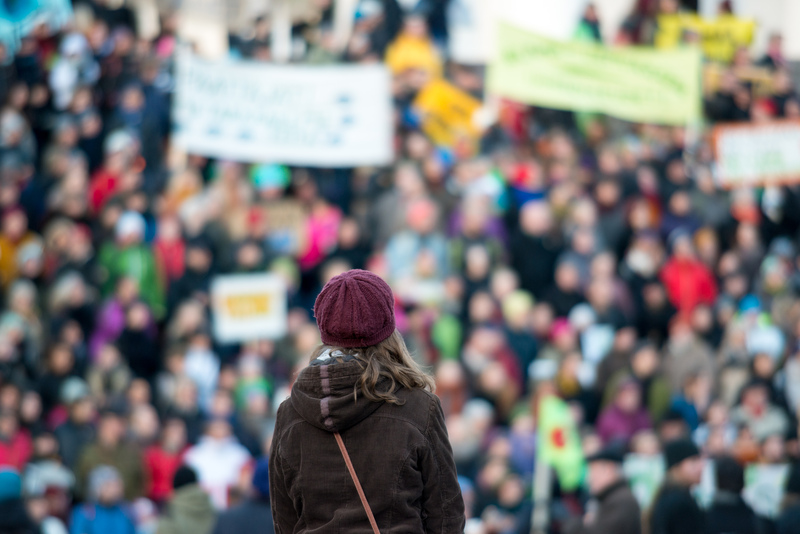 Other top climatologists have strongly considered abandoning their research in order to pursue activism – a field where emotion and conviction are encouraged, not supressed. 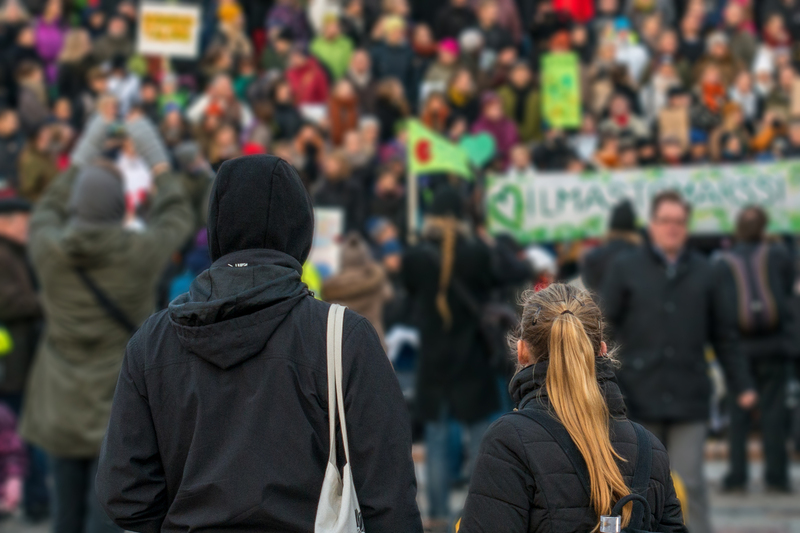 More recently, though, those within academia have begun to explore the possibility of encouraging a paradigm shift, recognising that sometimes activism – and emotion – can exist alongside good scholarship. In an article in the Chronicle of Higher Education last year, Audrey Williams June explored the phenomenon of ‘engaged scholarship’ and the possibility that academic activism may be ‘gaining traction as a worthwhile pursuit.’ If scientists are supported in devoting time and energy to exploring new ways to build relationships with politicians and business leaders, for example, perhaps they can learn how to hold the hands of policy-makers to guide them through their findings. Even better, if scientists can learn to write good opinion effectively, they can gradually displace the mass media columnists who currently monopolise public discourse about contentious scientific issues. Sites like the Conversation, which launched in 2011, go some way toward constructing a new model of scientists as passionate – and intelligently opinionated – actors, who care deeply about how their work is received and acted upon. Shrewdly, the Conversation is presented in the same format as other online news sources – with regular columnists, and space for breaking news and comment – but explicitly prohibits contributions from those who cannot demonstrate expertise in the topic at hand. The unspoken, and audacious, goal of the site – which has now launched local editions in Africa, France, the United Kingdom and the US – is to draw readers away from existing tabloids and broadsheets, and encourage readers to closely scrutinise the qualifications of those who report or comment on complex issues. Even better, the model pioneered by the Conversation breaks the gridlock faced by scientists' trepidatious about approaching the media with their findings. A letter from climate change ecologist Anthony Richardson, published on Is This How You Feel? Other projects, too, are slowly creating spaces for scientists to reflect upon their work personally. 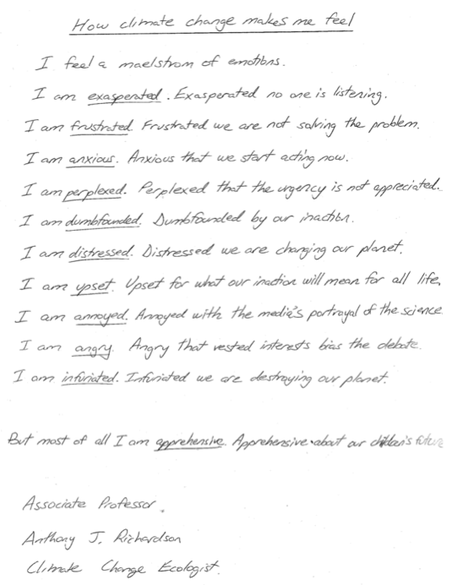 On Is This How You Feel?, for example, Joe Duggan publishes hand-written letters from climate scientists who reflect on the emotional toll their research has taken. It seems unsurprising, then, that climatologists might be emotional about job cuts – and, perhaps, unsurprising that now they’re learning that it’s okay to express it.